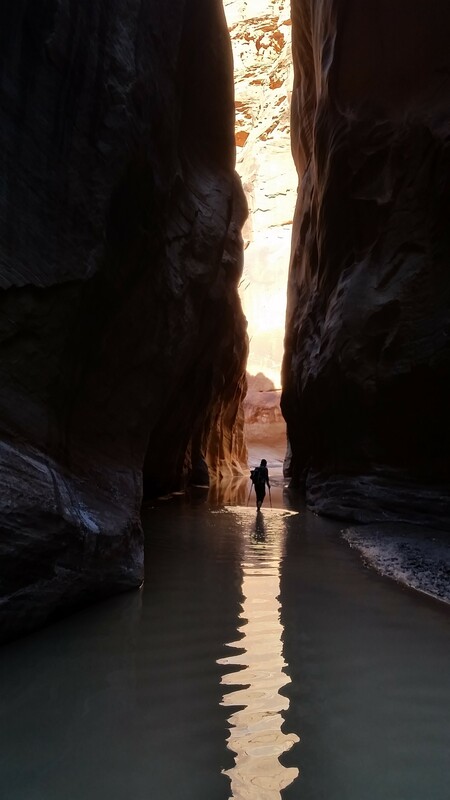 The Buckskin Gulch boasts to be the longest slot canyon in the world, located just on the boarder of Utah and Arizona in both Grand Staircase-Escalante National Monument and Paria Canyon-Vermilion Cliffs Wilderness Area of the Bureau of Land Management. A good friend Mark and I went to pick up a friend (Josiah) at the Arizona/Utah boarder once he finished the AZT 750 mountain bike race. 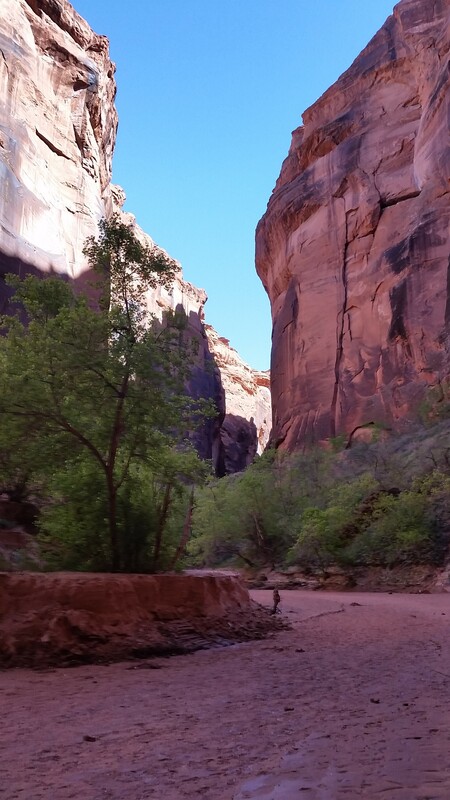 We figured since we were in the area we should take advantage of it and go see what the Buckskin Gulch had to offer. 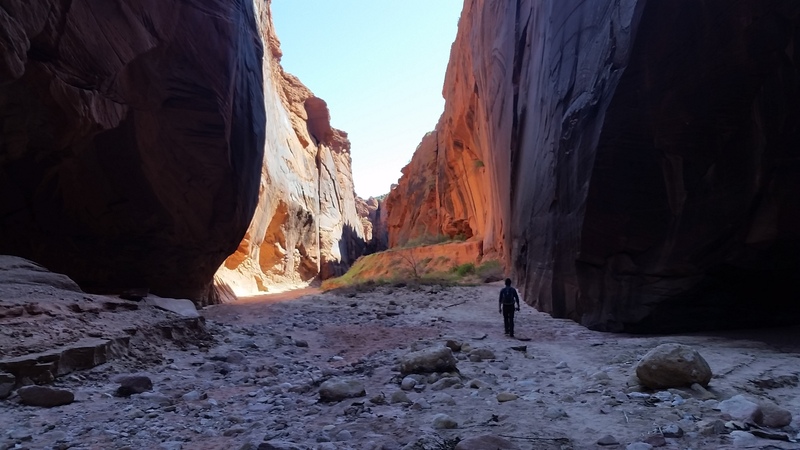 We planned on entering via Wire Pass trailhead, hike 13 miles down the Buckskin Gulch to the confluence of the Paria River, then turn North, and hike up the Paria River 7 miles to the Whitehouse trailhead where we would finish the long journey. We arrived on Saturday and set up camp at the Stateline Campground. In the middle of the night the tent door zipped back and a bright light shined in our faces. It was Josiah, finishing 3rd in the AZT 750, exhausted, smelly, and in bad need of a beer and a bed. Mark got up and the two chatted for a while I caught up on my desperately needed beauty sleep. The next morning we woke early, ate breakfast, and laughed about recent outdoor adventures as Mark and I packed up for the long slot canyon haul. Josiah dropped us at the Wire Pass trail head and drove to Whitehouse trail head to wait for us to finish out the 20 mile hike. As Josiah drove away we knew this was the point of no return, and there was no choice but to finish the trek we started! Wire pass started as a wide open wash with open desert, rocks, and brush on either side. Twisting and turning along the wash the surrounding sandstone rocks walls finally begin to climb, leading to the gulch. 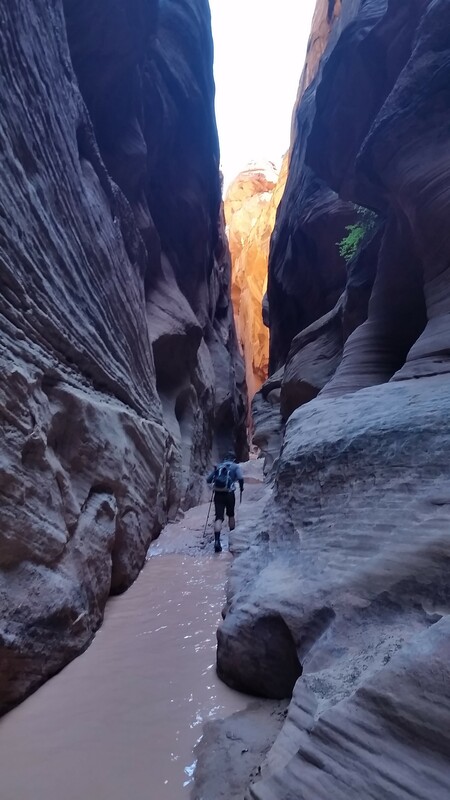 The tightest parts of the slot canyon were said to be in this first 1.7 mile section just before hitting the confluence of Wire Pass and the Buckskin Gulch, it was shoulder to shoulder at some points. We let out into the confluence greeted by towering walls on either side. 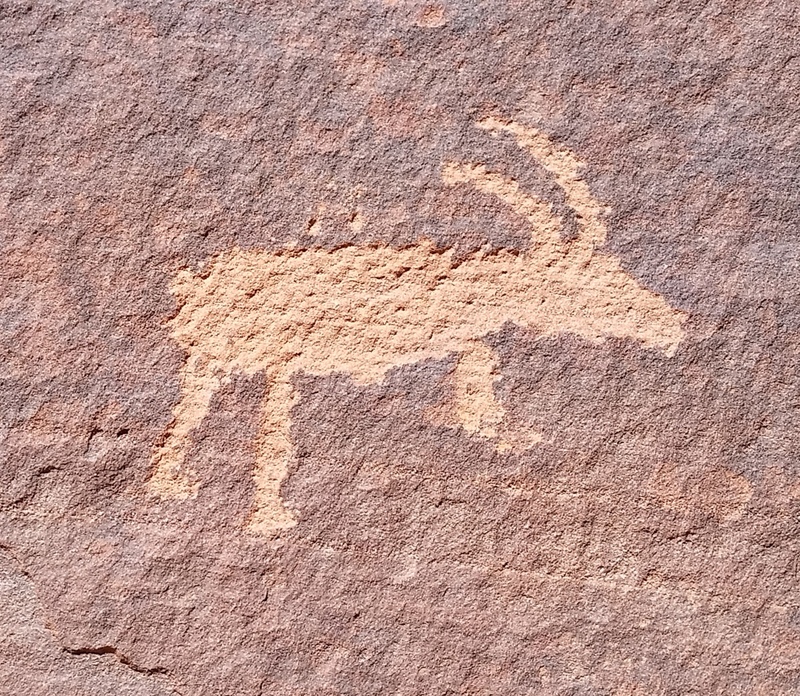 At the month of wire pass the blackened walls were etched with rarely seen Indian petraglyphs, very cool! After stopping for some quick pictures, we turned up and into the gulch to embraced the towering walls and dark depths. Trekking along the canyon winded in and out with a bottom of sand, mud, and river rocks. Trekking poles aided in keeping balance over the rounded rocks while we snapped pictures of what seemed to be an unnatural world of sandstone. 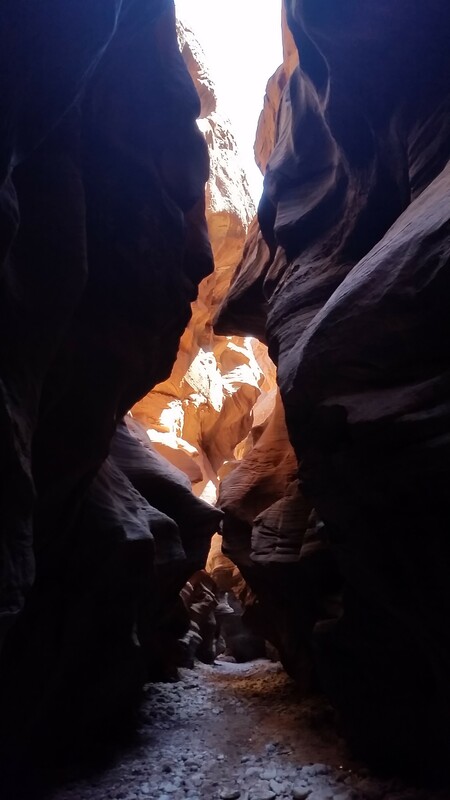 After trekking through the canyon for some time we came to an area called the “cesspool”, and rightfully so. In the bottom of the gulch the sunlight rarely has time to beam, leaving any standing water to only the air to warm. With cool 30s at night, we were faced with a 2 miles stretch of murky, shivering cold, intermitted water pools. Mark, thinking ahead, brought neoprene socks for the slosh; I unfortunately did not have his foresight. My legs were shooting in pain from the near freezing water numbing out the nerves in my feet and lower legs. Just after exiting the pool, the nerves would come back to life, hurting all the more. That was just before I hit the next pool, this went on for 2 miles, the longest 2 miles of the whole canyon for me. Mark seemed to be trekking along just fine like a fat cat with a saucer of milk . . . hindsight is 20/20. 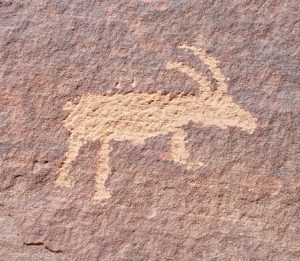 Finally we pushed past the “cesspool” section and let out at the middle trail where we were rewarded with a few panels of pretraglyphs, both at eye level and 50-100 feet above the floor of the canyon. We stood for a minute speculating how the Indians could achieve such a feat of great heights before turning back to the task at hand and trekking our cold we bodies out into the warm welcoming sunlight. We trekked on, coming to a small climb called the Rock Fall. 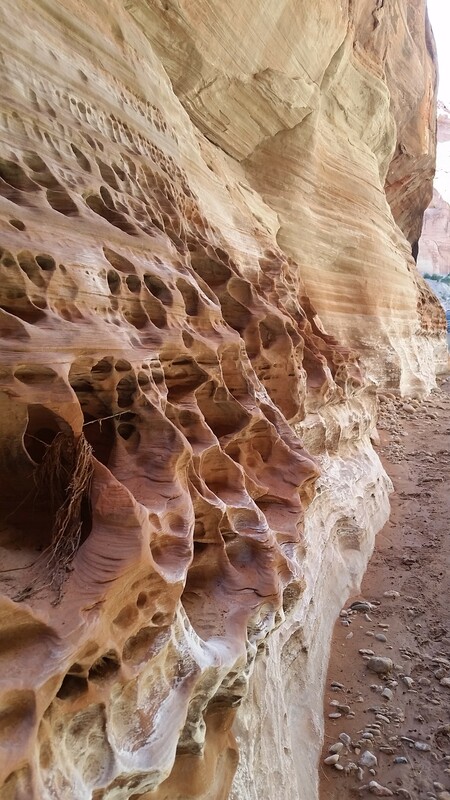 Here there were another sign of the Indians that once occupied the canyon in the form of Moki steps. Indians carved into one of the rock faces footholds to ascend the face and bypass the rock wall without the aid of rope. After the rock fall we continues to twist and turn, coming to the Wolfs Knoll where many backers would stop to camp in these high-rise grass and tree covered safe havens that would keep any trekker away from harm’s way in the event of a flash flood. We marveled for a moment more, and then pressed on. 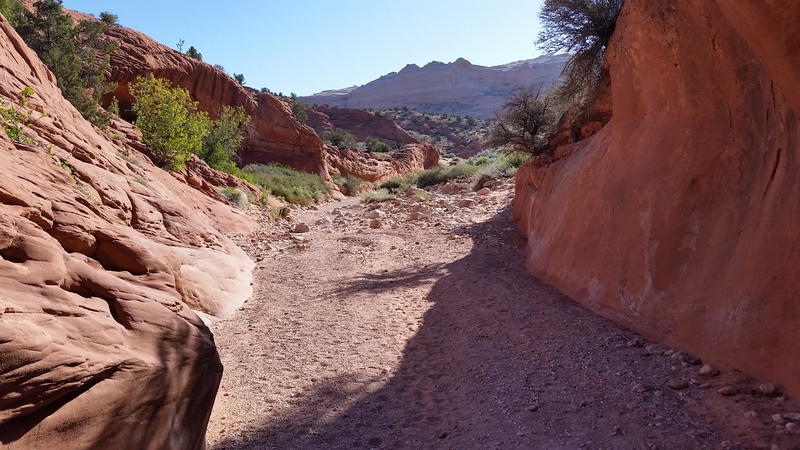 Just after the Wolf Knoll, we hit the confluence of the Buckskin Gulch and the Paria, noted by an immediate left turn and running water from the Paria River. Knowing there were only a few miles left we pushed on through the heat of the day in the ankle deep water of the Paria. 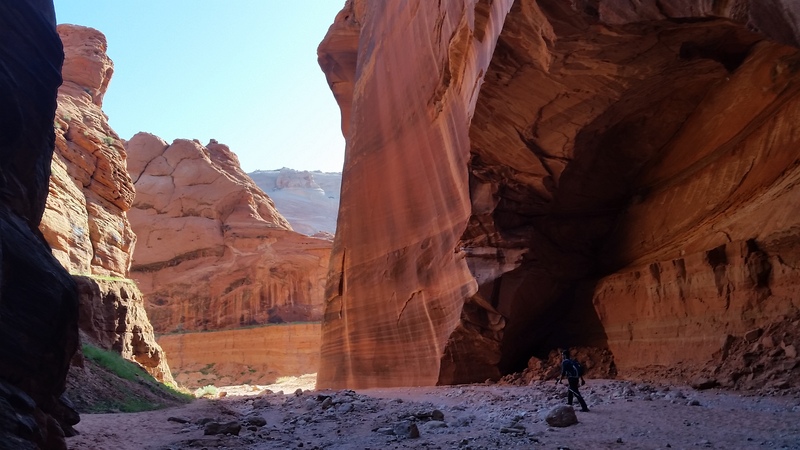 We topped momentarily for snacks and the chance to tick our trekking poles in deeps pools of mud near the canyon walls. Just as the gulch tightened up in the beginning, it began to give way and open up the further north we walked. The high walls soon became vast views desert, random sandstone formations in the distance, and soon the Whitehouse trail head. Absolutely beautiful country. A must see! 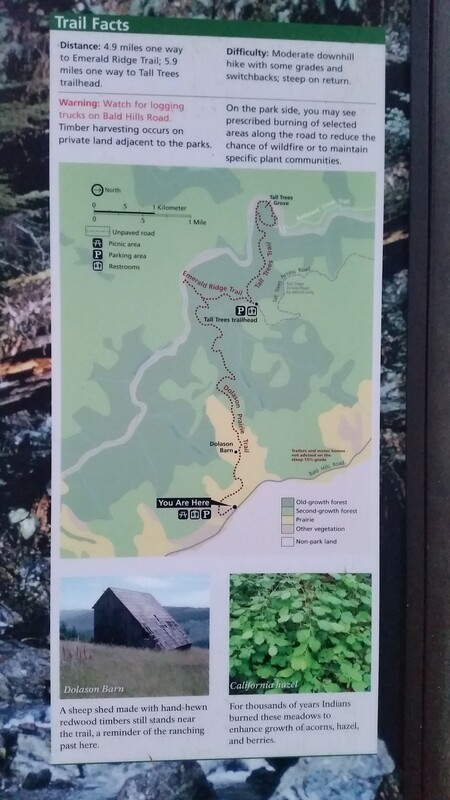 We finally reached Whitehouse trail head and were both glad to see Josiah after the 20 mile, 10 hours trek. We kicked our feet up and exchanged stories and a refreshing cool brew to celebrate the completion of all our journeys. Then again, we always had tomorrow to look forward to. Here is to good treks with good people, and good times. Cheers! Here the trees grow right out of the rocks! !